Movie Moments is the newest series from Funko's line of Pops. They depict classic scenes in movies, represented in the Funko Pop style and look. This review is for the Funko Pop Movie Moments It Pennywise in the Gutter. It is based on a now classic and famous scene from last year's phenomenal It, based on, of course, the Stephen King book of the same name. In this depicted scene, Georgie meets Pennywise who is in a gutter. This happens after Georgie has chased down his paper boat that his brother made for him. Pennywise talks to the kid, and then, ultimately, kills him. It is a great and chilling moment that is wonderfully captured in this amazing Pop figure. It is a Hot Topic exclusive, albeit one that has already sold out of stores and online. Unless, they get new shipments, you will probably be paying $55 and up for it, as opposed to the $32 price at the store, itself. I was fortunate enough to get it at Hot Topic this past Sat, as it was literally flying off the shelves. In fact, I got the last one! You can see the front packaging at the top of this review. I love that the bottom front of the design of the box has the little paper boat about to go down the gutter. The window allows you to see the figure from the sides and top, as well as the front. Once you take out the figure out you will get a good look at the background, a beautiful painting of Pennywise and Georgie that was used in the movie's poster artwork. The figure, itself, is amazing. One that can only be fully appreciated by taking him out of the box, I feel, as the detail is jaw-dropping. It is thick and sturdy and has some real weight to it. The colors on the pop really, well, pop, especially on Georgie's yellow raincoat and the blue rain water. Georgie looks particularly adorable. He also has the only articulation on this toy, as you can move his head around. I also love the positioning on him, with one of his hands pressed on top of the wet ground. Pennywise does not have any articulation, but then you can only see his head and, and as such, isn't necessary. With his large, light blue eyes he is the perfect mix of creepy and cute! As I mentioned earlier, the detail is incredible. From the look and feel of the grass to the little ripples made by the falling rain, this piece is beautiful and cool to look at. The following pics you will be able to see the other sides of the figure. In short, the Funko Pop Movie Moments It Pennywise in the Gutter is flawless. As a matter of fact, it may very well be, the greatest Pop ever made! 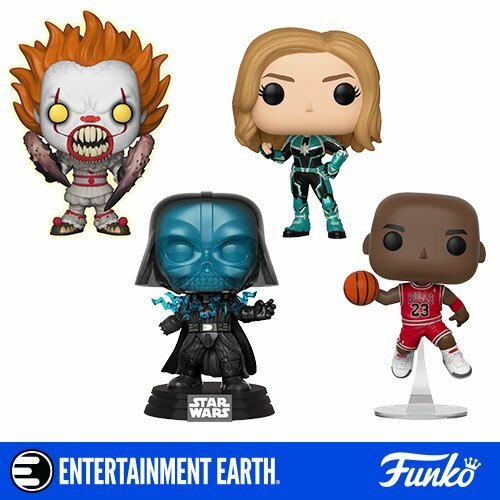 If you collect Pops, and are into horror, Stephen King, and/ or It/ Pennywise, it is an absolute must have. But, if you missed it, you will have to be willing to pay the above mentioned second market price. If you are OK with this, or are lucky enough to find him at a Hot Topic, then get him immediately!